Officials from Greenland and Iqaluit city councillor Simon Nattaq signed an agreement Thursday for the Nunavut capital to host hockey events for the 2016 Arctic Winter Games. 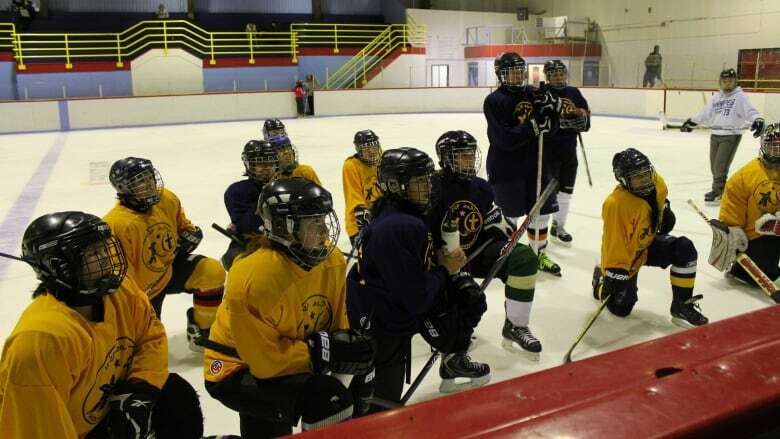 Officials from Greenland and the city of Iqaluit signed an agreement Thursday for the Nunavut capital to host hockey events for the 2016 Arctic Winter Games. Iqaluit city councillor Simon Nattaq signed on behalf of the city. Nuuk, Greenland, will be the main host for the Games but the city doesn't have an arena. Maliina Ablesen, general manager for the 2016 Arctic Winter Games in Nuuk, said hockey participants will be flown back and forth. "All the participants, even the ice hockey participants, they will fly into Nuuk, be part of the opening ceremony, then they will fly back to Iqaluit," Ablesen said. "And then the competitions will take place here and then they will fly back to Nuuk to be participating in the closing ceremony." Ablesen said while flying the players back and forth will be expensive, it would cost more to build an arena that Greenlanders likely won't use. Other ice sports — curling, figure skating, short-track speed skating — have been cut from the 2016 games along with dog mushing and gymnastics. Yukon, the Northwest Territories and Alaska have said they would host a companion event for the excluded sports.